8th edition of the meeting of finance directors – CFO Congress, will be held on April 16 in the Czech National Bank in the centre of Prague. The event, which traditionally welcomes about two thousand finance directors and members of top management of large and middle-sized companies, brings news from a finance management and, more importantly, open discussion and sharing of new observations. CFO Congress 2019 builds on the tradition of previous editions of this top meeting. It brings 6 hours of presentations, case studies and discussion moderated by well-established Daniel Stach from the Czech Television. Specialized Procurement Forum 2019 as a part of the afternoon parallel program sections is the novelty of this year. The Forum will be open not only to finance directors, but also to procurement managers who will join only afternoon session for special bargain price or those, who will accompany their CFO during the morning program dedicated to the strategic issues. Thanks to this new structure, the finance directors have a wider choice of topics than before. In the afternoon, they may participate at the deeper discussion about procurement or join the section dedicated to selected aspects of successful finance management. The detail program has been just published here. The structure of the program enables to the participants to learn as much as possible about the news and efficient trends for responsible finance management within one day. Both finance directors of important companies from the Czech market and experts from finance area meet in the program. The initial part of the Congress is dedicated to the trends and strategies. In will start with traditionally highly valuated macroeconomic trends presented by a top expert David Marek from Deloitte company. Among other topics, he will speak about the risks connected with the brexit which causes serious problems due to its chaotic leading currently. Hot news from the area of technology and especially ways how to maintain financial transparency during the process of its implementation will be another big issue of the initial part of the program. The great news is that this topic will be covered by a joint presentation of IT expert – Martin Diviš from Cisco – and his client, Lukáš Klášterský (CTO from Erste Group). The relation between a finance management and a bank is another up to date topic which is often demanded by the participants of the Congress. Michal Nebeský, general director of Citibank will discuss about what should CFO require from his bank. The first strategic part of the program will be closed by another highly topical issue – frauds in organizations (Alexander Nagy, Deloitte) and efficient purchase (Subodh Kumar, Procurement Negotiator). The big panel discussion which develops the relevant questions into the discussion with the audience will come after the series of presentations on fundamental strategic topics. Finance directors representing different fields and types of companies (Alza, CreativeDock, Čepro, DEK, ELTODO, Plastika Kroměříž) will join the discussion. The afternoon program gives a choice between 2 parallel program sections called Pillars of CFO´s Success and Procurement Forum 2019. This part of the program is also rich in experts and members of the top management of successful companies (e.g. Amplio, Bisnode, Refinitiv or Siemens). The participants of the Congress represent divers specter of fields from industry, among transport, energy, telecommunication, IT to finance sector. The program is planned for both large and smaller companies. 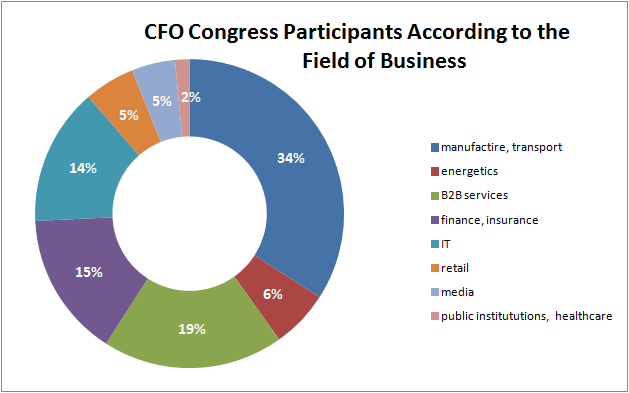 CFO Congress is brought by Blue Events company with the support or various partners, headed by an expert guarantor Deloitte, gold partner ALEF and technology partner Cisco.